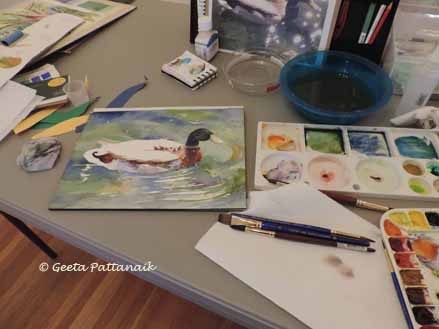 In the first picture I show the water around the duck after the first pass has been painted and the duck itself in the beginning stages of the painting. The masking fluid is still on the paper, in the places, where I intended to leave the white of the paper. Also in the picture is the mess around the painting table, and my little notebook in which I work out my color notes. In the second photo, above is my reference photo, from which I did the painting and below is my completed painting with the masking fluid taken off and the edges fudged. Before removing the masking fluid, I did a further pass in the water area, going slightly darker. The areas in which the ripples were white, towards the bottom right of the duck in the first stage of the painting, has gone darker now. The only really whites are the glints on the water. 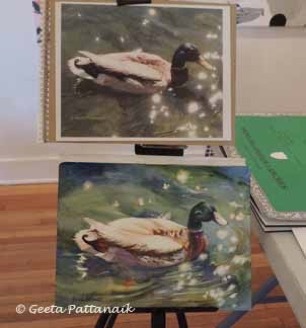 I cropped this picture from a very large photo of a lake, but to paint it in class would have been impossible, so I cropped it to paint the duck, but also at the same time to tackle painting water and the effects of light and reflections. I love to challenge myself and my students. After doing this painting, tackling water in a watercolor painting will be a bit easier for me.